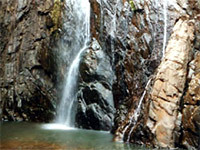 The Pradhanpat hill with its picturesque waterfalls offers a rare scenic beauty. These falls are close to Deogarh, the district headquarters town that is attractively situated with the background of wooded hills. Deogarh is 96 km from Sambalpur on National Highway No. 6. This entry was posted in Orissa, Pradhanpat. Bookmark the permalink.